Here Comes the Bride tells the story of five different people who get their souls switched in the middle of a wedding preparation on a solar eclipse. Stefanie's (the bride) soul gets into the body of the snobby Precy, whose soul gets into the yaya, Medelyn, whose soul switches with Bien, the grandfather, whose soul enters the gay beautician's body, Toffee, whose soul enters Stefanie's body. The problem is the souls are happy where they are except for the bride, whose wedding is coming. She now has to find a way to get into their own bodies. 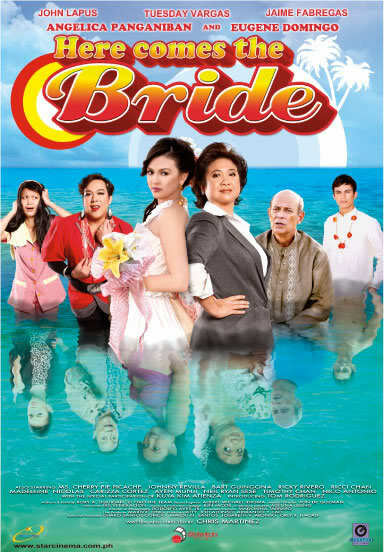 Here Comes the Bride is a 2010 Filipino comedy film starring Angelica Panganiban, Eugene Domingo, Tuesday Vargas, Jaime Fabregas, Tom Rodriguez, and John Lapus. 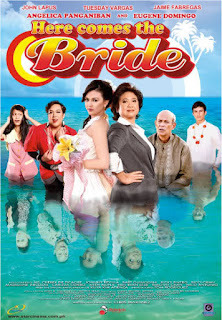 It was released by Star Cinema. The film had international screenings in select cities in the United States such as in San Francisco, CA, Milpitas, CA, Vallejo, CA, Los Angeles, CA, Bergenfield, NJ, and Guam.